Project connected: Full power has been achieved at Westermeerwind. The 144MW wind farm comprises 48 Siemens 3MW turbines and lies in the Ijsselmeer lake in the Netherlands. Vessel charter: The MPI Adventure vessel has been contracted to assist with the commissioning works of the substations at Vattenfall's 288MW Sandbank's offshore project. The vessel will provide accommodation services, lifting operations and provision of supplies. Cable supply: ABB has won an order worth more than $250 million from Dong Energy to supply a 220-kilovolt (kV) high-voltage cable system to Hornsea Project One. It will supply alternating current submarine cable systems to the project, which will transmit power over the 120-kilometre distance from the offshore wind farm to the east coast of England. Set-back: A Massachusetts state agency has recommended that the 468MW Cape Wind offshore project be denied a two-year extension of permits for two subsea and underground cables. In a preliminary recommendation, staff at the Energy Facilities Siting Board said that the request to extend the permits until 1 May 2017 should be denied. Service base: Siemens is to develop an offshore service hub in Eemshaven, Nethernlands, from where it will install and maintain the 600MW Gemini. A contract has been signed with EMS Maritime Offshore, for the construction and operation of a base at the Dutch port. First monopiles: Offshore construction has commenced at Dudgeon with the installation of the first of the 67 monopiles. 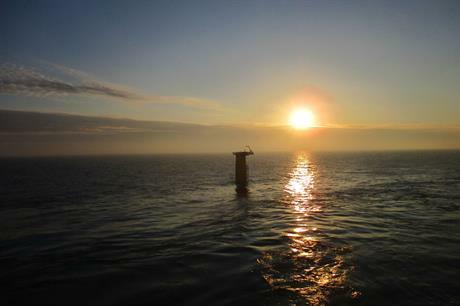 The Oleg Strashnovis vessel is being deployed at the UK North Sea project site off the east of England. Cable order: ABB has won an order worth around $80 million from Rentel NV, to supply the cable system that will connect Rentel's offshore substation to shore. ABB will design, manufacture and install the 40 kilometer long, 220kV alternating current system, which will have a transmission capacity of around 300MW.